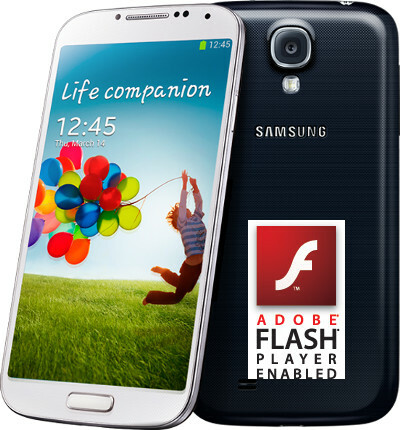 Update: After KitKat (4.4) update, you must use the unofficial APK file to make Flash player work on Galaxy S4 again. Please read Part 3 for details on the Flash Player APK file for KitKat. Update 2: If you updated Galaxy S4 to Android Lollipop, please follow this guide to make Flash work on your Galaxy S4. Once you get your hands on your brand new Galaxy S4, you may encounter the Flash issue. Galaxy S4 does not support Flash! Even after you side-load the Flash (see below on how to do this), neither the stock browser (Internet app) nor the bundled Chrome recognize Flash. For Chrome for Android, we all know Flash has been never supported. Do not confuse this Chrome with the Chrome on your desktop. But for the stock browser, it is quite strange, because the stock browser (with Jelly Bean 4.2) in Nexus 7, Nexus 4 and Nexus 10 all work charmingly with Flash!. For Jelly Bean 4.1, there are no issues even on Samsung’s own handsets, for example, Galaxy S4, Galaxy Note 2. What’s wrong? Apparently, the stock browser in Galaxy S4 was altered by Samsung to block Flash plugin and other plugins as well. So, to make Flash work on your S4, we need both Flash player (which is not pre-installed) and a third-party browser. Before jumping to how to do this, let’s get some background information on why Flash has been an issue for Jelly Bean.